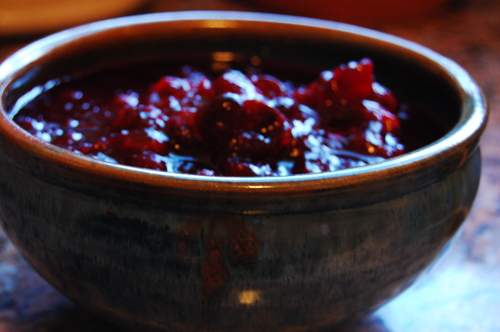 When I was a kid, I was completely horrified by cranberry sauce. Mostly because I associated all cranberry sauces with what comes out of a can. Which, is horrifying. I don’t trust the way jello-like things move. It weirds me out. But, in adulthood, I’ve come to appreciate the made fresh cranberry sauce. It’s tart, flavorful, and the perfect gravy substitute for turkey-topping. 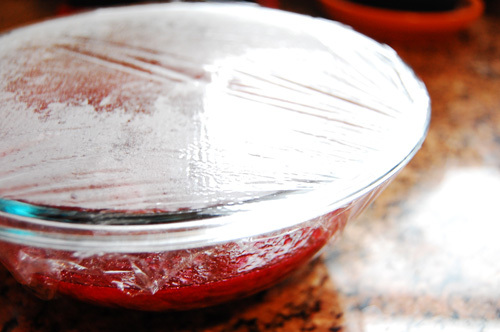 This particular recipe, adapted from the back of the Ocean Spray bag, is sooooo easy. And, it can be made in advance, so it’s one less thing you have to worry about Thanksgiving morning. My strategy this year for our Sunday Thanksgiving is to have everything premade by Saturday except the turkey and the stuffing. That way, I just heat up the casseroles Sunday right before we eat, and voila, Thanksgiving! I will admit that I made a bit of a mess making this. 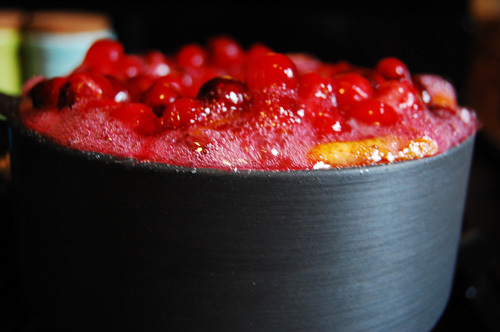 For photographic purposes I used a smaller pot, which backfired when the cranberries boiled over. Now my kitchen smells vaguely of caramelized cranberries. Which is okay with me. Bring water and sugar to a boil. 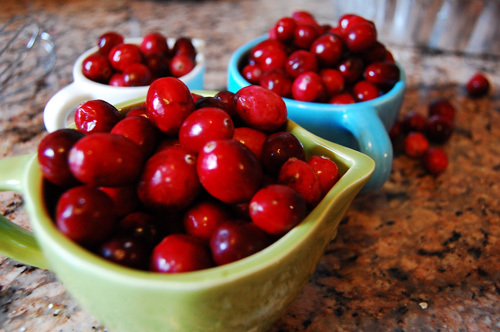 Add cranberries and zest, and return to a boil. Reduce heat and simmer for fifteen minutes or so, stirring every once in a while, until the cranberries burst. Squeeze in orange juice. Remove from heat, cover, and cool completely at room temperature. Refrigerate before serving. I know, I know, two pie recipes in a row? What can I say, I love pie (I’m a baker at heart. I only cook real food to appease my stomach). Also, thanks to a tornado warning in D.C., I unexpectedly got the day off. And since Dan had already mentally committed himself to playing video games all day, I decided it was the perfect opportunity to test a new recipe. That, and it’s pie season. I have to stay on my game. 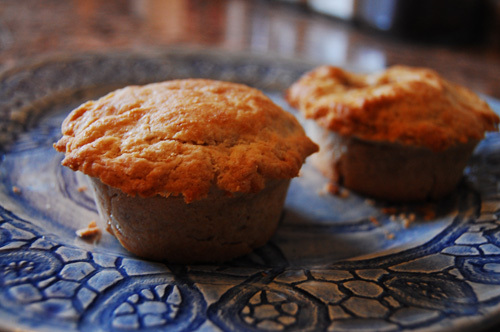 I’ve wanted to make cup pies, or miniature pies baked in a cupcake dish, since that fateful episode of Pushing Daisies where Chuck convinces Ned to add cup pies to his menu, with her honey baked into the crust. Which, by the by, is a show that I could not love more. And the fact that pie is a central character helps. It’s all the crime I love from CSI in brilliant colors, with quirky characters, and pie. 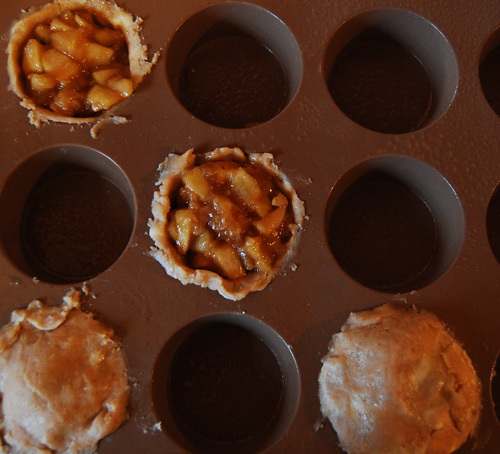 Anyway, I’ve made miniature pies before, but in those novelty shaped aluminum dishes, with mediocre results. And since the holidays are soon approaching and I’d like to show up for Christmas with an assortment of holiday cup pies (chocolate chess, pumpkin, pecan, sweet potato, etc), I thought I’d test the recipe out before hand. I started with my basic pie dough recipe, to which I added brown sugar, cinnamon, and honey. I also cut the recipe in half. Other than a few things, cup pie baking is essentially pie baking, just smaller. 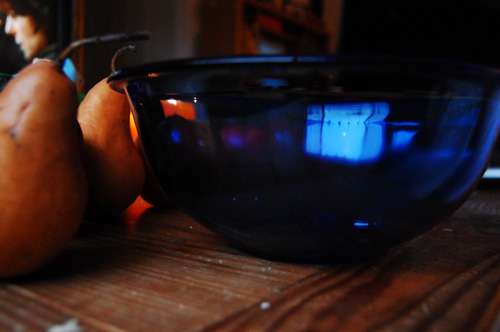 Be sure to cut your apple pieces very small (I would suggest 1/4″ chunks). Also, lightly grease your cupcake pan. I use silicon bakeware for cupcakes, pound cakes and bunt cakes because it’s just so much easier to get them out. Believe me, I ruined a right many cupcakes because half of them stayed behind in tin (Which, incidentally, is where the cupcake cake came from). 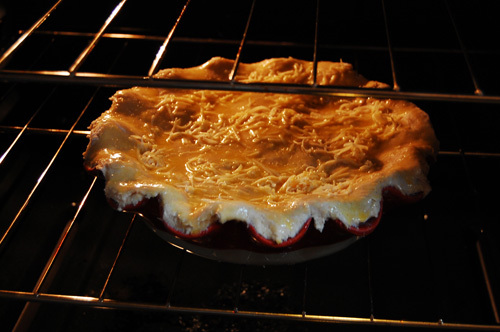 When you’re putting the bottom crust into the pie dish, leave a nice lip, so that you can attach the top to the bottom. The first few I did I failed miserably, but got the hang of it by the last one. These pies are delightfully adorable, enjoy! Once your crust is made, melt butter in a saucepan. Peel, core, and dice apples. 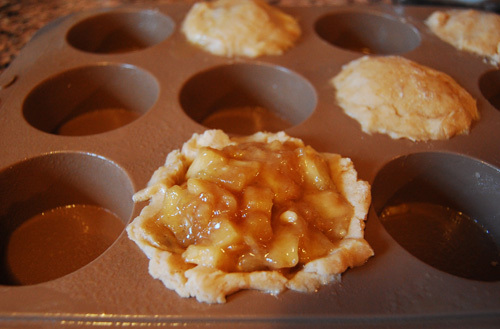 Since these are mini pies, you want them to be smaller pieces of apple. 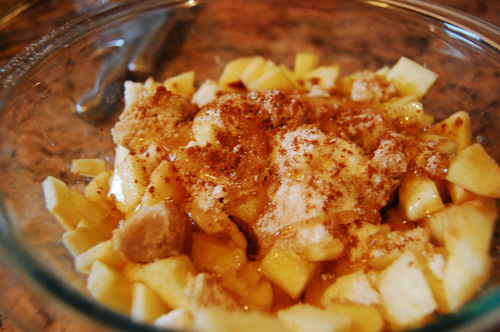 Toss the apples in sugar (brown and white) and cinnamon, and two tbsp of honey. 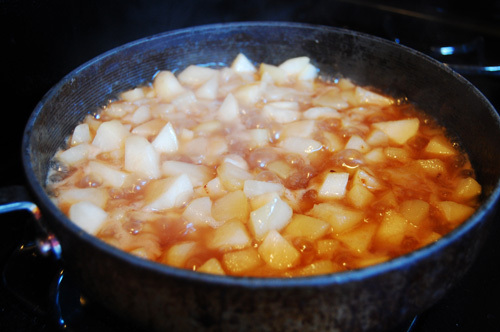 Simmer in melted butter until the apple pieces are soft. Stir in vanilla and flour, and remove from heat to let cool. Take your dough out of the fridge, and preheat your oven to 425*. Lightly grease your baking pan. Now, I know that you’ll be cursing me for this while you’re applying the dough, but it’ll save you broken-pie heartache down the road. Press dough into alternating cupcake holes, leaving a 1/4 inch lip over the edge. Fill with apple mixture, and press top on, making sure to pinch together the top and bottom crusts. 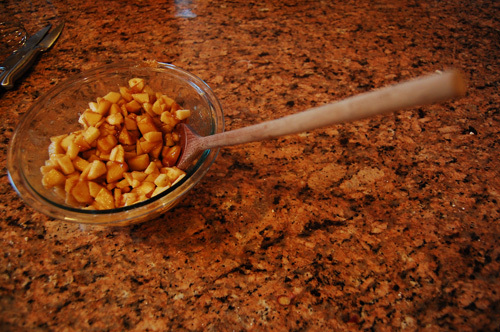 This is more important than when you make a regular size pie, because these are leaving the dish, to stand alone. They can’t be falling apart. Whisk together egg and remaining honey. Sprinkle the pies with brown sugar, brush with egg mix, and cut slits into the top. Bake for 15 minutes at 425*, then reduce the heat to 350* and bake for another 15 minutes. Keep an eye on them- they’re so small they could easily burn. Remove from cupcake pan and serve. Now, as someone who was raised in “real” America and currently lives in “fake” America, my take on the American experience is well… very American. Influences from my conservative parents to my left wing art school friends have shaped who I am, and the way that I eat and cook. I’m just as likely to eat a Garden Roll at my favorite sushi place as I am to make grits, which I think makes me a very typical American. 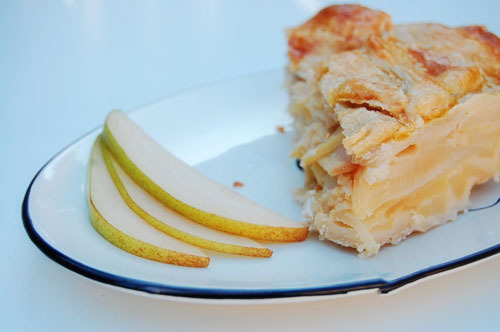 So, in the spirit of a bipartisan, holistic, and unified America, I’m offering you a new twist on an American favorite, the apple and pear pie. This pie is originally based on something I saw on Food Network at some point. I believe it was originally a Giada recipe. Anyway, like most recipes, the first time you make them they belong to the creator. By the fourth or fifth time, you’ve changed and adapted the recipe enough that it’s your own. This is a pretty malleable recipe, so I shop for and make this pie based on whims. This week at the farmers market there was a wonderful display of apples and pears, so I picked two pears and three apples. 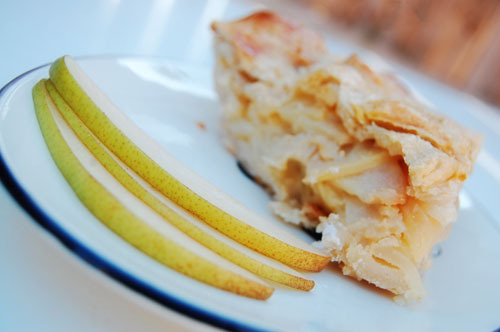 What makes this pie so tasty, I think, is the relationship between the pear and apple, as well as the spices. I’ve posted a general pie crust recipe, which you can adapt for this pie by adding nutmeg, cinnamon, ginger, and honey into the crust. Really, the most important thing to keep in mind while making a pie is pacing. Some elements, like how long the pie crust needs to sit in the fridge or how long the fruit needs to simmer, impact how you go about making the pie. It’s also important to adjust the recipe for your circumstances. This is the first time I’ve made a closed-top pie since I moved to our new apartment, and the top was brown within 45 minutes. Which means that I’m going to need to readjust temperature and time to fit my apartment. This pie is so perfectly balanced in texture, flavor, and weight, you’ll want to make it a staple in your American experience. My suggestion? Out with the old, in with the new! With a government overhaul and the promise (hope, no matter how naive it may be) of change, let’s adapt to fit. Start your pie crust, since it will need to sit in the fridge. For this recipe, you want to add nutmeg, cinnamon, ginger, and honey to your crust. Peel, core, and slice the fruit. Your chunks should be 1/2 inch or smaller. Squeeze lemon juice over the fruit, then toss in sugar, salt, and spices. In a large skillet or deep dish, melt the butter. 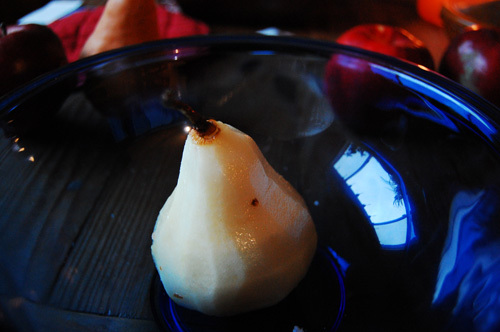 You’re going to cook the fruit until it’s tender, so you want your temperature to be low to medium. Add fruit and cook until juices simmer and fruit softens. You don’t want the juices to evaporate out. If they do, your pie will have a dry filling. So, watch it closely. When the fruit is tender, mix flour in. Add vanilla and honey, and remove from heat. Cool completely. Roll out bottom crust and place in pie dish. Pour in filling. Roll out top crust and press on gently, pinching bottom and top together to create a seal. Cut slits in the top. Whisk together honey, egg, and sugar. Brush onto the top.